Toxic chemicals sprayed on farmland could be damaging the health of people who live or work close by. This is the conclusion in a report from the Royal Commission on Environmental Pollution. The Commission says that such a link, although not proved, is possible. And they're calling on the government to be much clearer about the scientific uncertainty over the dangers and recommend a five metre buffer strip between crop spraying and nearby homes. He agreed that "this is a question of rather difficult science". we feel there's plausibility that some of those ...are ill because of sprays"
Part of the problem, according to Sir Tom Blundell is that those living nearby crop sprays often do not know what chemicals are being used on the crops - so its impossible to find out if they have had an effect on residents' health. We also spoke to Georgina Downs who has campaigned on this issue and Peter Sanguinetti from the Crop Protection Association. They had a heated discussion about the proposals from the Royal Commission. Georgina, who lives close to a crop spraying area and has chronic longterm health problems said that the five metre buffer zone proposed by the Royal Commission is not enough. While Peter Sanguinetti says the zone is not neccessary as a two metre buffer zone is shortly to be introduced. Representing crop sprayers, Peter Sanguinetti said, "We are confident that oru products are safe when used correctly". But Georgina Downs says the issue is not about the misuse of crop sprays, but the overall exposure that people who live and work in the countryside have to endure. 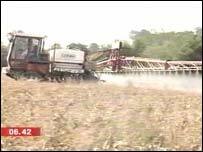 Dousing fields with chemicals to kill bugs is standard practice across much of British farming. It helps keep the pests at bay and without it, crop yields could be much lower. But over the last few years a number of people claim to have fallen ill after pesticides were sprayed near their homes. Illnesses cover nervous disorders, birth defects, depression and even cancer. The link between the condition and the chemical is not proven by this report but they do suggest that it is plausible. They want more research. Proposals from the commission include health studies on those who work with pesticides or live close to where they're applied, more animal testing to discover if small exposure is damaging and more work to discover exactly how far spray droplets can travel . But farmers are sceptical about some of the claims for illness blamed on pesticides and insist responsible spraying threatens neither their neighbours nor themselves. The Commission wants new safeguards including a five metre buffer zone between any crop spraying and homes or workplaces. The government says it's studying the report and will respond in due course.